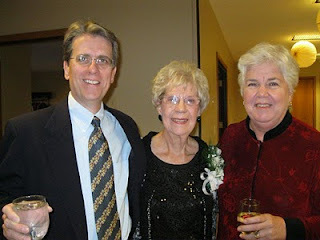 This picture of my wife Ann and me, flanking Blanche, a member of the Saint Matthew congregation, on her ninetieth birthday, was sent to us by Blanche's son, Bill, today. Blanche is an incredibly special person of deep faith, resilience, and great humor. It's a privilege knowing her! That's the title of this article written by one pastor of the Evangelical Lutheran Church in America (ELCA). In it, he's asking the congregation he serves to leave the ELCA. But his arguments are as potent in supporting those who decide to stay in the ELCA and seek its reform and renewal. The root issue of every flash point of controversy in the ELCA--whether it's universalism v. the Lordship of Jesus Christ, the notion of the Kingdom of God as something humans can create politically v. the Kingdom of God as something God is already bringing into being through Jesus Christ, or questions about human sexuality--is the authority of God's Word. Unless the Word of God is the ultimate arbiter of our life, faith, and practice, the Church is no longer the Church. Ahead of His Time or Just in Sync with God? I mentioned here the latest book my wife and I are reading together in our longer jaunts: Mayflower: A Story of Courage, Community, and War by Nathaniel Philbrick. In that earlier post, I cited Philbrick's discussion of how the Pilgrims' pastor, John Robinson, who remained in Europe when one-third of his flock sailed to North America aboard the Mayflower, had envisioned a secular government in the New World, one that, in its way, anticipated our contemporary vision for pluralistic democracy. I also mentioned that, early in his book, Philbrick makes clear his intention of portraying the relationships of the English settlers and Native Americans in all its complexity. Mayflower is no simplistic white hat v. black hat telling of the Pilgrims' story. We saw the complexity to which Philbrick referred in a part of the narrative we read today, on our way to the gym to work out. Several years after their arrival in the New World, the Pilgrims (and the "Strangers," non-Separatists, who were part of their settlement) had formed something of an alliance with the Pokanoket tribe and their sachem, Massasoit. Massasoit got wind of a conspiracy involving other tribes. They intended to attack and eliminate the Pilgrims at Plymouth, as well as another settlement of English at Wessagussett. The Pokanoket weren't disinterested in the conspiracy because it was aimed at them as much as at the English. According to Philbrick, Massasoit demanded that the English engage in a preemptive strike against the conspirators. Partly for fear of offending the Pokanoket, the Pilgrims felt compelled to undertake a wanton slaughter. But avoiding offense was only one part of their motivation. So was the desire to show the Native American conspirators who was boss. Governor William Bradford bragged about the killings at Wessagussett in a tract published in England, Good News from New England. And, Plymouth's military leader, Miles Standish, had a particular desire to kill one of the Native American leaders, having earlier been offended by the latter's supposed arrogance toward him. [Robinson] refused to forgive the Pilgrims for "the killing of those poor Indians." When he heard about the incident back in Leiden [in the Netherlands], Pastor John Robinson sent Governor Bradford a letter. "Oh, how happy a thing had it been," he wrote, "if you had converted some before you killed any! Besides, where blood is once begun to be shed, it is seldom staunched of a long time after. You say they deserved it. I grant it; but upon what provocations and invitements by those heathenish Christians [Englishmen at Wessagussett]?" The real problem, as far as Robinson saw it, was Bradford's willingness to trust Standish, a man the minister had come to know when he was in Leiden. The captain lacked "the tenderness of the life of man (made after God's image) which is meet," Robinson wrote, and the orgiastic violence of the assault was contrary to "the approved rule, The punishment to a few, and the fear to many." Robinson concluded his letter to Bradford with words that proved ominously prophetic given the ultimate course of New England's history: "It is...a thing more glorious in men's eyes, than pleasing in God's or convenient for Christians, to be a terror to poor barbarous people. And indeed I am afraid, lest by these occasions, others should be drawn to affect a kind of ruffling course in the world." Robinson's characterization of the Native Americans hardly passes muster today, of course, and rightly so. But he clearly saw the tragic stupidity of unprovoked attacks by people who professed to be Christians, members of his own flock. In that sense, John Robinson might be seen as having been, once more, ahead of his time. But, in another sense, the values he espoused in the wake of the massacre are timeless. God's laws of right and wrong have always been written on our hearts. Most of the human race, most of the time though, in big ways and small, prefers to suppress that truth, following the road of perceived self-interest or convenient acquiescence to the prevailing winds of opinion. John Robinson, at least in this instance, didn't fall into that trap. Every human effort to do the right thing is simply an example of our trying to catch up with God. The truth of what's right and wrong is know to all of us. But when you want to be your own god--the common human hang-up, displayed in many different guises--you don't want to know about God or God's will. That's why Pilgrims, who claimed to be pious Christians, killed Native Americans and it's why so many people today claim that truth is a relative term. God's will can be so inconvenient. ...with a surprise ending. At least, the question Margaret Warner asked was a surprise to me. This entire story, from its straight-forward account of the engineering challenges that were supplanted to save the Chilean miners to the boffo finish, will make you feel good! What if Dr. John Watson wasn't a nineteenth century veteran of "the second Afghan war," but a twenty-first century vet of the current conflict in Afghanistan? And what if, rather than using opium to sharpen his deductive reasoning, Sherlock Holmes, due to the difficulties associated with developing a proper smoking habit in the London of 2010, slapped three nicotine patches on his arm? These and other questions are pursued in, A Study in Pink, the first episode of a new re-imagining of Sir Arthur Conan Doyle's famous tales of Holmes and Watson. This episode is an updated version of the first Sherlock Holmes story, A Study in Scarlet. The new series, Sherlock, premiered this week on PBS' Masterpiece Mystery. As a longtime Sherlock Holmes fan, I admit that I was skeptical when I first learned of this project relocating the fictional detective in 21st-century London. The film incarnations of Holmes have, except for the Jeremy Brett series in the 1980s, been horrible, anyway. A post-modern Sherlock seemed like a really bad idea. But, while A Study in Pink drags a bit at the end, I enjoyed it and look forward to more episodes of Sherlock. It's fun. Below is the first chapter of the episode. Watch it to get a feel for the series or click where indicated to watch the whole thing. Enjoy! "Apart from Me, you can do nothing"
No one can be right with God or experience anything like psychological good health who has not first acknowledged their helplessness. Read Philip Yancey's piece here. It's one worth reading again and again. What Do You Do with a Shoe Box? Stephen: Hey, you know what I’ve been thinking about lately? Kirsten: What have you been thinking about lately? Stephen: I’ve been thinking about what exactly I could do with this shoe box. Laikyn: Why have you been thinking about that? Grace: Oh, the answer to that’s easy. Geometrically speaking, a box is a solid with three sets of surfaces, each set paired in their dimensions. One of those surfaces though, is a lid. And when you pull the lid off the top of the box, there’s a big empty space where new shoes used to be. Stephen: Exactly. Everything you said was on the tip of my tongue. ALL: But what to do with the empty space inside the shoe box. Laikyn: Well, why not just toss the shoe box into the trash? Then you wouldn’t have to answer any question. Problem solved. Grace: That’s true. But it would be a shame to ruin a perfectly useful shoe box. Jacob: (grabs shoe box and puts it on head) I think it would make a great hat. Stephen: Hmm. I don’t know. Kirsten: (grabs shoe box, sets it on the altar, and pulls out toy BP oil tanker) I think it would make a great garage for my BP oil truck. Laikyn: Nah, it might spring a leak and ruin the shoe box. Grace: (grabs shoe box) That’s true. But you know what? I’ve got a great collection of belly button lint. It’s getting too big for the re-sealable Glad bags I’ve been using. [Looks at the box as though inspired.] Just think, this box could be the start of the International Belly Button Lint Museum. Stephen: Uh, that’s a great idea and all. But, somehow belly button lint and a shoe box don’t seem to go together. Kirsten: That’s true. But what about a toe jam museum? Laikyn: Maybe we should forget about the whole museum-in-a-shoe box thing. Jacob: Hey, I know. Operation Christmas Child! Stephen: That’s a great idea! Grace: What’s Operation Christmas Child? Kirsten: Operation Christmas Child? You have been spending too much time with that belly button lint! Laikyn: Operation Christmas Child will let all the people of Saint Matthew fill shoe boxes (or plastic boxes like them that they can buy at places like WalMart, Target, Meijer, and other stores) and fill them with Christmas gifts for children in Third World settings. Jacob: But most important of all, once they reach distribution centers around the country, their boxes will also be filled with a comic book in the languages of the children who receive them. In words and pictures, it will tell them about Jesus. That will be the best Christmas gift of all: The good news that God so loved them that He gave His only Son so that all who believe in Him will live with God forever. Stephen: That’s a great thing to put into this shoe box. Grace: [turning to congregation] So, watch next Sunday’s bulletin and your emails this week for instructions on how to fill your shoe box with the good news and love of Jesus! Stephen: [also talking to congregation] And then, on Sunday, November 14, bring your shoe boxes filled with gifts for some of the world’s neediest children. We’ll have a wrapping party after our luncheon. All: What can you do with a shoe box? In 1 Timothy, the first letter he sent to the young pastor, Timothy, Paul wrote, “I am giving you these instructions, Timothy…in accordance with the prophecies made earlier about you, so that by following them you may fight the good fight…” (1 Timothy 1:18). For those of us who have grown sleepy with an unchristian sentimentality over the Bible’s description of Jesus as “the Prince of peace,” all of Paul’s talk about living out faith in Christ as a “fight,” may be a bit jarring. Don’t misunderstand! Jesus is the Prince of peace. Paul himself wrote a lot about how, in Christ, God made peace with the human race and offered us the incredible peace of knowing that all who trust in Christ belong to God forever. “All this,” Paul writes in 2 Corinthians, for example, “is from God, Who has reconciled us to Himself through Christ…” And in Ephesians, it’s written of Christ, “He is our peace.” Through Christ, we can have peace with God, with others, and even with ourselves. Sometimes, those struggles will be within us, as we battle to stay faithful in the midst of experiences we can’t explain and, that we fear, are beyond our endurance. But often those struggles will be with other people. Hold onto Jesus and you will sometimes be in conflict with others, sometimes with people you once thought were close to you. “Do not think,” Jesus says in the Gospel of Matthew, “that I have come to bring peace to the earth; I have not come to bring peace, but a sword. For I have come to set a man against his father, and a daughter against her mother, and a daughter-in-law against her mother-in-law; and one’s foes will be members of one’s own household. Whoever loves father or mother more than me is not worthy of me; and whoever loves son or daughter more than me is not worthy of me; and whoever does not take up the cross and follow me is not worthy of me” (Matthew 10:34-38). Each week here at Saint Matthew, through the words of either the Apostles' or Nicene Creeds, we confess that the God we know in Jesus Christ is the only rightful Lord and King of the universe. We confess that only Jesus is worthy of our ultimate allegiance. And we also confess that it is only through faith in Jesus Christ and repentance for sin in His Name that humanity can find joy, healing, hope, forgiveness of sin, reconciliation with our Maker Who we push our of our lives when we sin, and everlasting life. Make confessions like these, both Jesus and Paul tell us, and you will have a fight on your hands! And that's especially true if your faith in Jesus Christ is more than just words recited in this sanctuary on Sunday mornings. When we dare to carry Jesus beyond these walls, we may find ourselves in a fight or two. When we dare to love the unlovable or forgive the unpardonable, we will offend people and get a fight. But even in the face of resistance, we must ask God for strength to keep fighting the good fight: to keep making disciples by telling others about Jesus, to keep letting Christ show in our lives as we love God completely and love our neighbors as we love ourselves, to keep serving in Jesus’ Name, to keep giving to the cause of Christ in the world, to continue to offer prayers in Jesus’ Name, even for those who hate us, to keep fighting to tell the truth about God's Word and God's will. God fought for us all the way to the cross and then, after Jesus’ crucifixion had seemingly signaled that nothing about us could be made right, the Father pulled the Son up from the grave and gave Him life again, a life that He shares with all who turn from sin and trust in Him. This good news has changed our lives forever! Today, it’s our task, no matter how we may be buffeted, rejected, ignored, or scoffed at, to fight the good fight to communicate over and over, however many times we may need to repeat it in words and actions, that God really did so love the world that He gave His only Son so that all who believe in Him will not be separated from God, but live with God forever. Sharing and living that message is the good fight of faith. It’s this message that Paul felt it worthwhile repeating again and again. And so do I. When life throws you a bad break, fight the good fight; hold onto Jesus. When you find yourself disagreeing with God about what constitutes a sin, fight the good fight; repent and ask God to help you to live according to God’s will, not your own. When you see a classmate mistreated or a co-worker shafted, fight the good fight; go to them and be the loving presence of Christ. George Hartman, a former missionary, was the senior pastor of Saint John Lutheran Church in Grove City for many years. I first got to know George when I was the twenty-five year old Elder of our home church on the west side of Columbus and Saint John was part of the same cluster of Lutheran congregations. I came to know George better when Saint John was a mission partner to my former congregation, Friendship in Cincinnati. George Hartman was absolutely sold-out, no turning back, no-doubt-about-it in love with Jesus Christ! He wanted people to be saved from sin and death by becoming Jesus’ disciples. I’ll never forget one Sunday afternoon some twenty years ago. The people of Friendship were invited to Saint John for a joint worship service celebrating and praying for our partnership. (At that time, Friendship had grown to a whole 20 members, including Ann, our two kids, and me!) I preached. Sitting in the front row was George Hartman. I explained that though Friendship was small, already our evangelistic efforts were paying off: We had seen several adults come to faith in Jesus Christ. I wasn’t going for sentimentality, just stating the facts: God uses our witness for Christ to bring eternal life to others. But just as I said that, I caught sight of George. There were tears streaming down his face as he thought about the people he would one day see in heaven. Folks, those were the joyful tears of a follower of Jesus committed to fighting the good fight of faith! Among our neighbors, family members, co-workers, and classmates, there are people we know who face each day without Christ and without the help that only He can bring. There are people we know facing an eternity without Jesus Christ. Doesn’t that make you fighting mad at sin, death, and the devil? Don't you want to fight for the well being of such people? Please, in Jesus’ Name, I beg you to pray for the spiritually-disconnected people in your lives. Serve them in Jesus’ Name. Above all, invite them to know Jesus. Our Lord is counting on you and me, as much as he did on Timothy and Paul, to fight the good fight of faith.